Why does the label say “Supplement Facts” rather than “Nutrition Facts”? And who decides your recommended daily value of vitamins and minerals, anyway? This primer explains. Go into your kitchen or bathroom and find a bottle of multivitamins, probiotics, or any other dietary supplement. You’ve probably glanced at labels like these hundreds of times, but have you ever thought about why some products say “Supplement Facts” while other seemingly quite similar products say “Nutrition Facts”? Or how the serving size was determined? And who decides your recommended daily value of vitamins and minerals, anyway? Dietary supplement labels are regulated by the FDA, whether it be the size of the font used or the type of ingredients that need to be included. This primer gives a quick breakdown of what each section means. 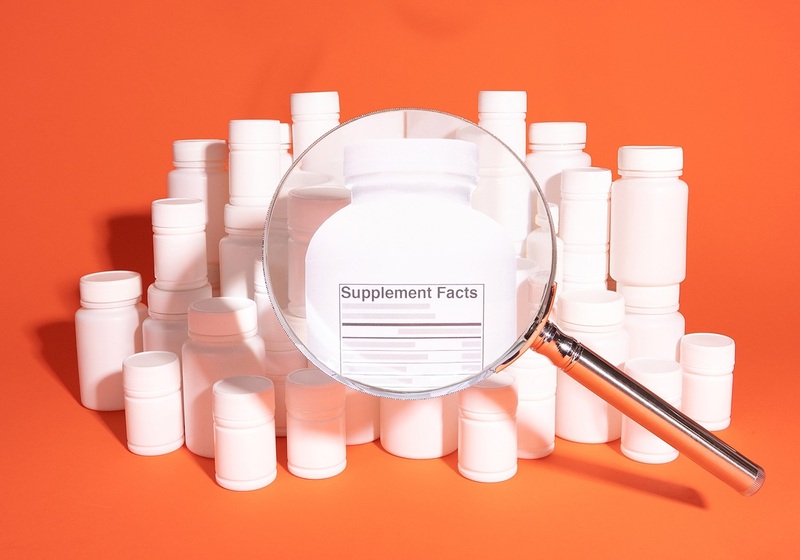 Supplement Facts: The FDA regulates both conventional foods and dietary supplements, and each category gets a separate label — “Nutrition Facts” for the former and “Supplement Facts” for the latter. But the difference isn’t always intuitive: Nutrition bars sometimes appear in both categories, and the same goes for some sports supplements like electrolytes, and even herbal tea. So what explains the difference? Mainly the labeling requirements for each. For example, the FDA requires that supplement labels include ingredients (and quantities thereof) for which there is no established daily value. That’s why an electrolyte tablet with magnesium, say, can be a conventional food, but one that lists a non-essential amino acid like tyrosine would be a supplement. Serving Size: This is, of course, the amount you’re supposed to take. But since there are no established daily values for most of what you’ll find in supplements, you’re relying on the supplement company to suggest an appropriate serving size. Theoretically, these ingredients have all been tested for safety in toxicity studies (done in animals), but unless there is human clinical data for the product or active ingredient the serving size is an estimation. Amount Per Serving: The most common units of measurement on a supplement label are milligrams (mg), micrograms (mcg), and International Units (IU). The first two are units of mass, while an IU is a unit of measurement for biologically active substances like vitamins and varies from substance to substance. % Daily Value: Daily values are the amount of nutrients that a typical adult should get according to the Dietary Reference Intakes (DRIs) established by the Food and Nutrition Board of the Institute of Medicine of the National Academy of Sciences. These are updated periodically and based on available scientific literature; DRIs for calcium and vitamin D were revised in 2010, for example. Because new data emerges frequently for some nutrients, there is some debate about specific daily values, particularly for amino acids for which daily values have been difficult to establish. Where you see an asterisk, no daily value has been formally established, so you likely want to do additional research on the available scientific literature. Ingredients: The ingredients are listed in descending order by weight. Storage and Expiration Date: The FDA’s Good Manufacturing Practices (GMPs) do not require an expiration date on supplements, but if there is one then the company must provide supporting data on the stability of the ingredient in various environmental conditions over time. Patents: Some supplements include patented formulations or make claims that are protected by patents. Disclaimer: You’ll often see the following phrase on a supplement label: “This statement has not been evaluated by the FDA. This product is not intended to diagnose, treat, cure, or prevent any disease.” This statement is required by the Dietary Supplement Health and Education Act of 1994 (DSHEA) on any product that makes a claim about how a product affects the structure or function of the body, and it’s meant to distinguish these products from drugs, which are regulated more strictly by the FDA.